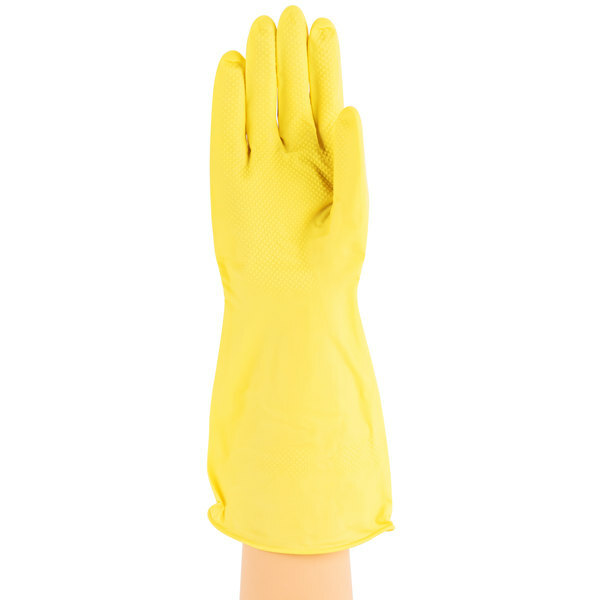 Keep your hands clean while washing dishes and performing janitorial tasks with these small multi-use rubber flock-lined gloves. 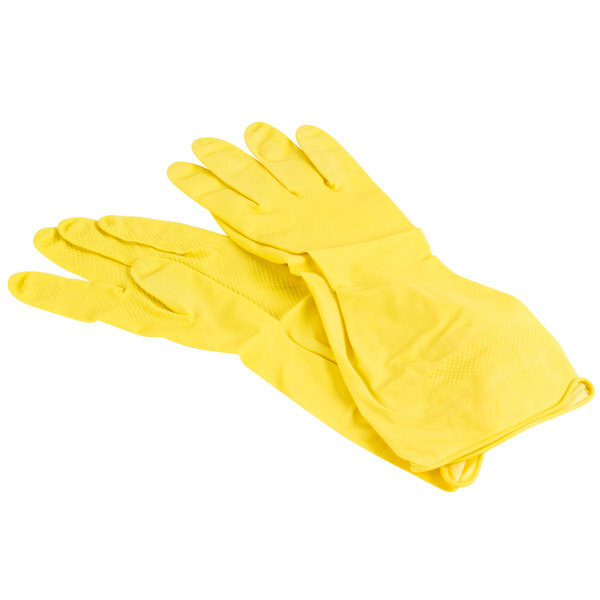 These gloves are great for keeping your hands dry while washing dishes, and to limit exposure to chemicals during routine cleaning around the rest of your facility! They are a comfortable and durable solution for a wide range of tasks in your business. This item protects hands against select chemicals in warewashing and other applications. "I really like these small multi-use gloves. They have small "grippers" on the inside, making it easier to wash dishes and are very durable. Well worth the money." 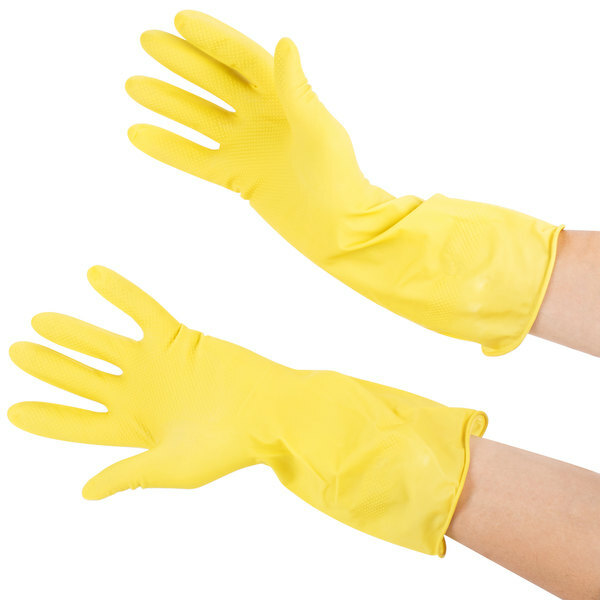 A bright yellow rubber exterior coating locks out water and chemicals, and helps these gloves to resist acids, animal fats, alcohols, and detergents. On the interior, the flock lining has a protective coating to keep hands dry, making them perfect for dishwashing, cleaning, and other applications. The textured fingers on these gloves give you a better grip when performing all kinds of tasks. These gloves form a barrier between your hands and potentially harmful chemicals. These small size gloves are sized for maximum comfort. Keep several different sizes available so that all of your employees can have access to a glove that fits perfectly. I use gloves every day for a multitude of uses so the type and quality of the glove it is very important. These gloves fit well and do the job, my only 'complaint' is that they are a bit slippery when you first use them so it takes a bit getting used to. Once you use them a bit, they grip things better but overall, they do the job they are meant for. THE PRICE IS DEFINATELY RIGHT ON THESE GLOVES! A DOZEN TO A PACK! CLEANING, DISHWASHING, GARDENING..WHATEVER YOU NEED. THE SMALL IS VERY SMALL, II HAVE SMALL HANDS BUT PREFER THE MEDIUM BECAUSE THEY ARE SO SNUG IN A SMALL. 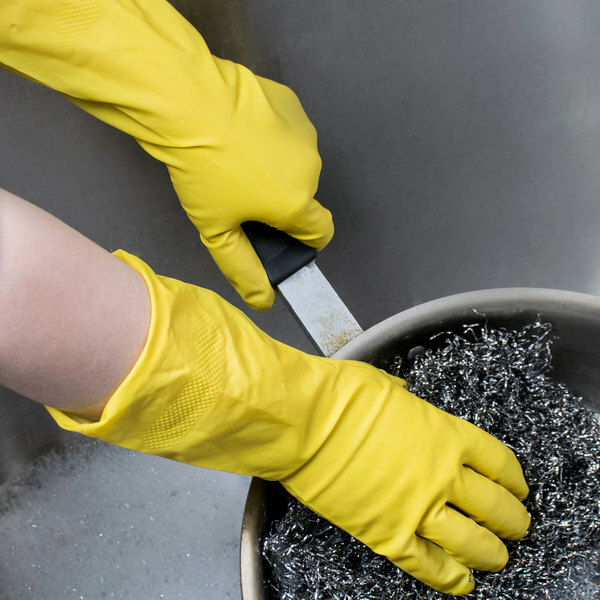 Washing those sheet pans and pots and pans can be really hard on your hands. These gloves come in handy when using handy clean tough stains. 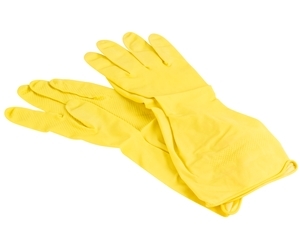 These gloves are good for heavy duty cleaning and for dishes when using really hot water. They are sturdy enough to use more than once but I wouldn't keep for too long. For this price, and the amount that comes in each package, it is worth getting a bundle and using for big cleaning jobs whenever they come up. I am one of the few people on earth that LOVES to wash dishes. However, I also LOVE to have my nails done. Therefore... I am in love with these gloves because I can wash all the dishes I want and my manicure stays in tact! 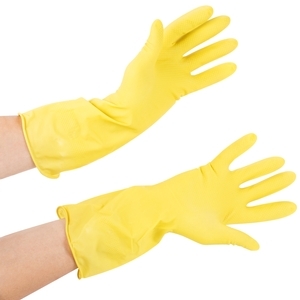 Nice multi use rubber gloves are great for any cleaning task or dishes. They are flock lined and grippy. Small size fits me perfectly, and the price can't be beat! These are really functional for duties around the kitchen. It’s thicker than I expected for such a cheap price. I just ordered a dozen more. These gloves come in all sizes and are great for protecting ones hands against any dirt, grime and harmful chemicals. I recommend buying a few pair to have on hand as they can become useful for anything really, even washing cars. My wife hates doing dishes and I mean with a passion. But, there’s no way around it. At least with these gloves, they protect her hands so she can take care of her specialty hand-wash only items. They do not withstand temperatures above boiling…you can feel the heat. These were too small for my hands but I have tried the product in my correct size and they work well for washing dishes or cleaning. Though these gloves do help to securely hold on to slippery dishes due to texture, I cannot find the interior lining. I am surprised by that. We appreciate your review, Antonia! We are sorry these gloves did not meet your expectations. If you have any issues with the product you purchased, please contact our Customer Solutions team. 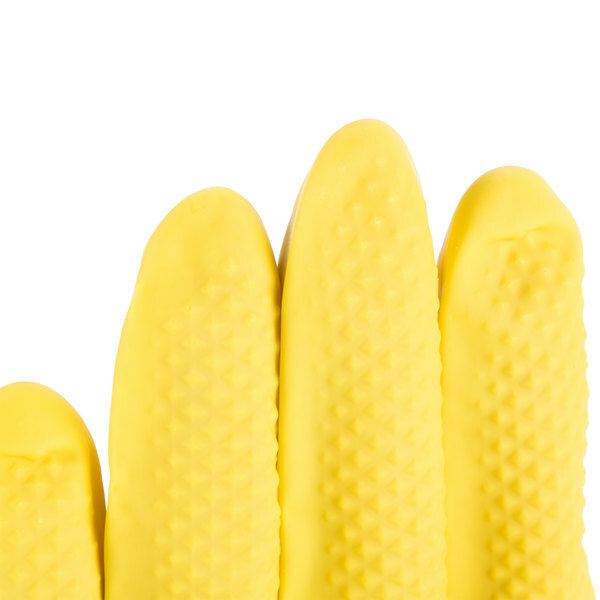 The multi-use rubber gloves are great for dishes, cleaning, and other tasks that require protecting your hands. We would rate these gloves and low to medium duty and are great for basic tasks. We would not recommend these gloves if you are needing a very heavy duty glove for use with extremely hot water. The small size is great for female hands. These are great large rubber gloves. Good size for most hands. The flock lining does a great job of preventing the gloves from sticking on the hands. Slide on and off easily and protect from chemicals and germs. Not as thick as the dishwashing gloves sold at Safeway but for the quantity and the price it is a good purchase. The pairs come individually wrapped which is great so that I can add it to a housewarming gift basket. 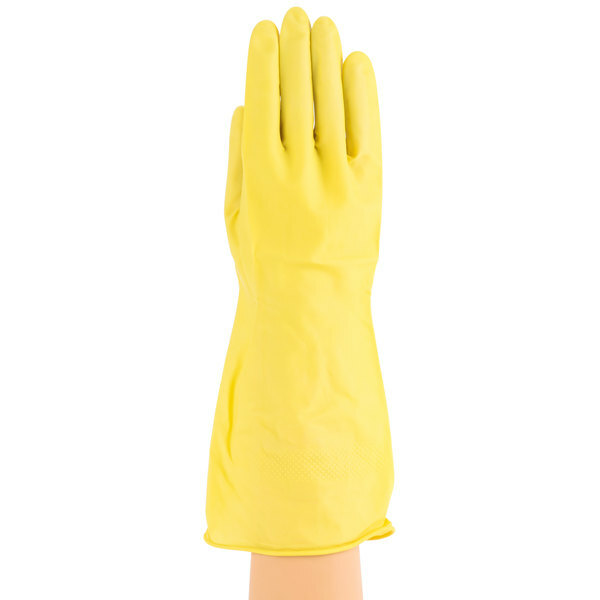 This small Multi-Use Yellow Rubber Flock Lined Gloves yellow latex gloves is perfect for dish washing, cleaning and even gardening. It keep your hands clean and away from harsh chemicals. I will buy them again. This will be a good fit for smaller petite females. They are so cheap so I have all the sizes so everyone could have gloves that fits them.